Tegmentum primi fasciculi The Atlantic, 1 Novembris 1857. 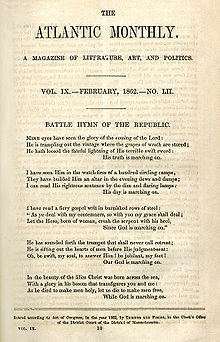 "Battle Hymn of the Republic" prima edita. The Atlantic est magazina Americana, nomine The Atlantic Monthly Bostoniae Massachusettae anno 1857 condita, nunc Vasingtoniae DC administrata. Pro magazina litteraria et culturali creata, cito per Civitates Foederatas famam confecit publicationis recognitionum virtutis cui erat prospectus modicus—famam quam plus quam 150 annos tenet. Magazina insigniter scriptores et poetas novos agnovit et protulit, ac maiores cursus confirmavit. Principum scriptorum commentarios de abolitione, educatione, et aliis rebus maioribus in negotiis hodiernias civilibus. Magazina pluria Praemia Magazinarum Nationalium quam ulla magazina menstrua abstulit. Periodicum post annos laboris pecuniarii et seriem novorum dominorum, iterum ut magazina argumentorum generalium conformata est, "res externas, civilitatem, et oeconomiam, [nec non] inclinationes culturae" attendens. Hodie lectores serios per civitatem et duces cogitationis plerumque petit. Conditor periodici fuit Franciscus H. Underwood, adiutor cuiusdam domus editoriae, qui minorem agnitionem quam socii accepit, quia "nec ventosus nec vir Harvardianus" erat. Alii fautores qui fundamenta magazinae iecerunt scriptores praestantes erant, inter quos Radulphus Waldo Emerson, Oliver Wendell Holmes (pater), Henricus Wadsworth Longfellow, Harrietta Beecher Stowe, Ioannes Greenleaf Whittier, et Iacobus Russell Lowell, primus editor. Anno 2010, The Atlantic primum lucrum decennii habuit. The New York Times in recognitione magazinae eo tempore observavit hanc rem gestam effectum fuisse "tranfusionis culturae, portionis contraintuitus, et multi vectigalis ex praeconio digitali merito." ↑ "The Atlantic Monthly," Encyclopedia Britannica. ↑ Anglice: "foreign affairs, politics, and the economy [as well as] cultural trends." ↑ "The Atlantic". amazon.com . 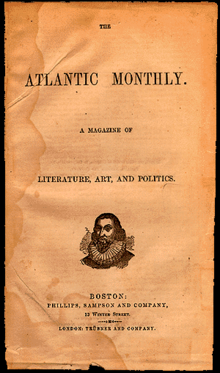 ↑ A History of the Atlantic Monthly, 1857-1909 Ellery Sedgwick - 2009 p.3 "The Atlantic was founded in 1857 by Francis Underwood, an assistant to the publisher Moses Phillips." ↑ The Letters of John Greenleaf Whittier, 2 (1975), 318: "Initiated by Francis Underwood and with Lowell as its first editor, the magazine had been sponsored and organized by Lowell, Emerson, Holmes, and Longfellow. " ↑ Anglice: "neither a 'humbug' nor a Harvard man." ↑ Susan Goodman, Republic of Words: The Atlantic Monthly and Its Writers (2011), 90: "Francis Parkman thought that the Atlantic's founder, Francis Underwood, never received adequate recognition because he was neither a “humbug” nor a Harvard man." ↑ Anglice: "a cultural transfusion, a dose of counterintuition and a lot of digital advertising revenue." ↑ Jeremy W. Peters, "Web Focus Helps Revitalize The Atlantic," The New York Times, 12 Decembris 2010. Vicimedia Communia plura habent quae ad The Atlantic Monthly spectant (The Atlantic Monthly, The Atlantic (magazine)).